When Susan's daughter, Lily, tells her that she's pregnant at 17, Susan is devastated. After all, she knows firsthand how hard things will be since she got pregnant at 17 herself. But then she finds out two of Lily's best friends are also pregnant ~ and all three did this on purpose. They made a pact to get pregnant and raise their babies together, despite the fact that they're all "good," bright girls who were on the road to college in the Fall. The other girls' moms are Susan's best friends, and soon they are all trying to come to terms with what their daughters have done, and understand what makes a good mother. 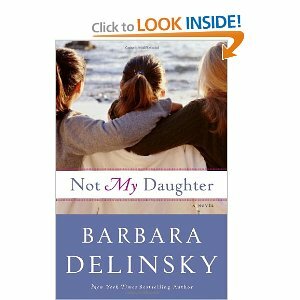 I read Not My Daughter by Barbara Delinsky because it's the June selection for my book club. It sounded somewhat interesting, although a little too much like chicklit for my liking, but I thought it had potential. Unfortunately, I just didn't like it. It was a relatively quick and very easy book to read, which is about the only good thing I can say. The writing style is simplistic and honestly comparable to a young adult novel. The storyline wasn't focused nearly as much on the girls' pregnancies and the implications on their lives. Instead, it was 300+ pages of the moms worrying about their own reputations and standing within the town. Most of the book was about Susan's role as principal and the potential for her to lose her job because of this pact and her daughter's involvement in it. There was way too much repetition of the same theme over and over. I would have liked to read a story about the relationships between the moms and the girls, and how they got through this difficult time. Delinsky sort of touched on this but was too focused on the moms' jobs and reputations ~ and throwing in a whole bunch of knitting references that seemed out of place ~ to really get deep into the relationships. It was a very superficial story with very little substance despite the potential with this topic. I feel like she could have done so much more with it. She had the components of a good story, but just didn't execute it well in my opinion. This review was written based on a copy of Not My Daughter that I borrowed from the library. Oh, too bad. I have wanted to read it. Sorry you didn't like it! :( Bummer! From the description, I suspect I would have the same opinion as you. But I disagree with your equating simplistic writing styles with YA novels - the really great YA novels have complex characters and plots and really good writing! Try The Hunger Games by Suzanne Collins to see what I mean. There is both great and mediocre writing at all age levels! Sue, that is a very good point. I have read The Hunger Games and it was excellent. I guess I just meant I felt the vocabulary and writing structure felt very elementary to me. But as you said, good YA books are actually written at a higher level than that. Thanks for the review Julie- I didnt really know what the book was about but from your description I may pass on this one. I was right the first time... I could have passed on it. Thanks for reminding me of this comment...that is sooo funny!